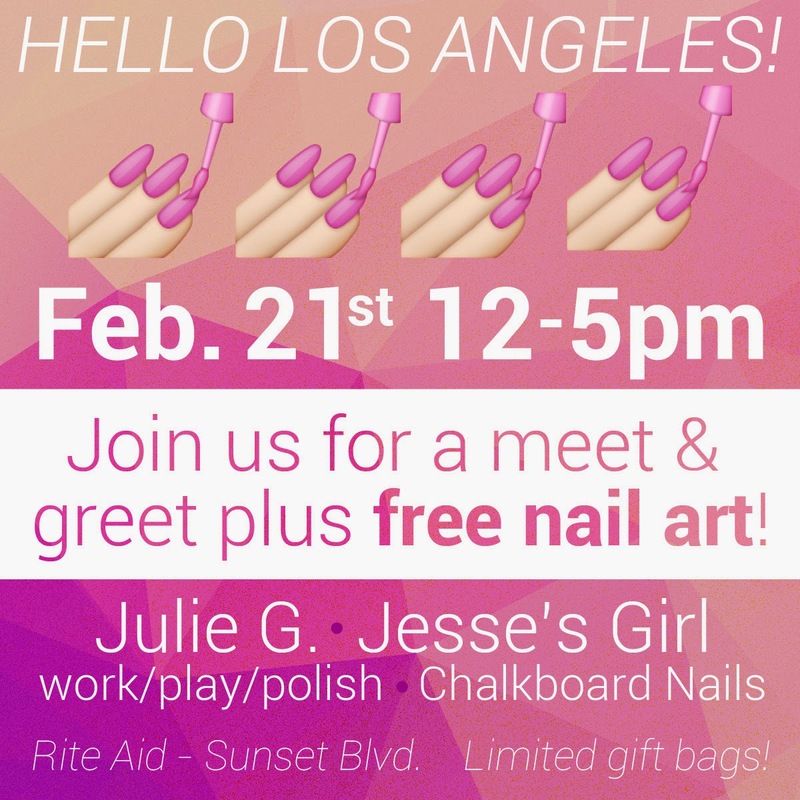 Free Manis with Me, Chalkboard Nails, and JulieG in Los Angeles on February 21st!!! Hi guys. I have some exciting news! One week from Saturday, myself, Sarah of Chalkboard Nails, and Julie of JulieG713 will be in Los Angeles for a Meet n' Greet! Come say "hi" and let us give you a free mani! We'd LOVE to meet you! The first 50 visitors will get a gift bag with JulieG Matte Finish Top Coat, JulieG Plumping Top Coat and JulieG Damsel along with a $1.00 off coupon for any Jesse's Girl or JulieG product. All of the details are below. Sarah and I have a jam-packed, nail-focused weekend planned with trips to OPI Headquarters, mani/pedis with Katie Cazorla of The Painted Nail, and more! I'm beyond excited. I'll be sure to share our adventures when we return. Please do come see us. I love connecting with you guys outside of the blogosphere!